It’s important that you take care of your lawn during Summer. A green, healthy lawn adds value to your home. Even more, it adds beauty and a homey feeling whenever we are in the comfort of our own house. 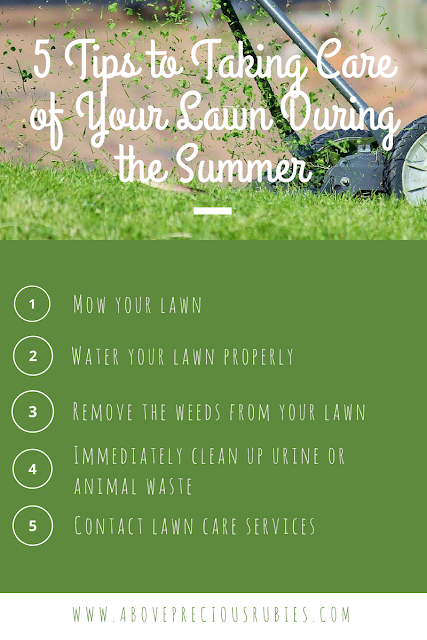 However, the summer heat can take a toll on your lawn which means that you may need to pay some extra attention to it. It also needs the right amount of water in order to avoid drying up in the sunlight. Your grass could quickly become dull or dry if you do not take care of it beforehand. Once you see early signs of pests or drying up in small patch areas, do not wait for it to spread out. Here are five tips for taking care of your lawn during the summer. First and foremost, it is important that you mow your lawn regularly to keep in good shape and health. You can do it once or twice a week depending on the weather in your area. The ideal height for your lawn has to be around 3 inches as it is with most type of grasses. You can also keep it shorter if you prefer to do so, however, avoid cutting it too short especially when the weather is very hot. You can leave the lawn clippings as a free fertilizer for your lawn. Your lawn needs to be deeply watered in order for it to stay as healthy as possible. Since watering a lawn can use up a lot of your water reserve, make sure to save rainwater as much as possible and use it for watering the grass. As a general rule, your lawn needs about 1 to 1.5 inches of water every week. Check your soil if it absorbs the right amount of water as it also varies with the type of soil that you have. Weeds are one of the reasons why your lawn can start becoming unhealthy. Hence, you need to remove it as soon as you spot it. You will be able to spot it immediately once you notice flowers growing or you see different-colored patches in your lawn. Before mowing the lawn, try to check if you can spot some as it is much easier to spot weeds that have not been mowed recently. If your dog or cat urinate the grass, flush it immediately with water to dilute the urine in the soil so it won’t result in dead spots on the lawn. Moreover, make sure to also dispose of any animal waste from the grass. If you don’t have enough time to maintain your lawn, the best option would be to hire lawn care services. You can look up lawn care in Centerville Ohio to see the services offered by lawn care specialists in your area. Having a professional take care of your lawn would be a great decision. Especially if you have a big area to take care of. They will be able to maintain your lawn for you.